There are many different names for the crime of damaging or destroying the property of another person. This is a surprisingly common crime, and police will often add other charges such as disorderly conduct when making an arrest. The official legal name for this crime under Maryland law is malicious destruction and the basic elements require that a person commit an intentional and willful act that results in private or government property from being defaced, injured, or destroyed. Under state law this crime is divided into two basic categories. If the damage is less than $500 then the act is a misdemeanor with a maximum punishment of 60 days. A defendant will not be permitted to pray for a jury trial in this instance. If the damage is more than $500 the maximum penalty rises significantly to 3 years in jail, and a defendant will be able to request a circuit court jury trial. The government is not required to prove a dollar amount of damages in order to get a conviction, but if the value cannot be determined then it is automatically deemed to be less than $500. 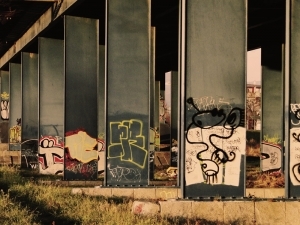 In cases involving graffiti the state may be able to assess an estimate of damages, and the defendant will be ordered to pay restitution upon conviction. If graffiti damages are not discernable the state or the judge may simply order a convicted defendant to perform community service hours. There are a few important things to understand about this crime, and a criminal lawyer can answer any questions about your specific case in greater detail. First, the state may add the value of the damages from multiple acts to determine the maximum sentence. If a person is accused of destroying two pieces of property that are both valued at $300, he or she may face the lengthier 3 year maximum jail sentence. On the other hand, if the two acts are entirely separate the state may not add the total value of the damage. Sometimes the state may try to subject a defendant to the enhanced maximum penalty when in fact they legally cannot, and it is up to the defense to make sure this does not happen. Although the maximum punishment for malicious destruction is not especially high, and most defendants typically serve little or no jail time, this crime can leave a permanent stain on a person’s criminal background. This is the type of conviction that can cause others to assume the worst about a person including anger management issues and lack of self control. The Herbst Firm understands that a destruction of property conviction should be avoided at all costs, and our lawyers will fight to assure that this charge can be dismissed and eventually expunged. Many times the people who are charged with this offense have no prior record and simply acted without thinking. We do not feel that one impulsive decision should have a lasting negative effect on a person’s future and our number one goal is a dismissal. If you or a family member one has been charged or is being investigated for this crime contact Benjamin Herbst at 410-207-2598 for a free consultation.